Chelsea's hopes of a top-four finish were dented as Everton finally ended a 25-match run without a win against a top-six side with a 2-0 victory. The Toffees' record against the Premier League's established powerbase is poor with their last success over one of them being a 4-0 hammering of Manchester City in January 2017. By contrast, Chelsea's two best performers Eden Hazard and Ross Barkley - one of seven changes from Thursday's Europa League victory over Dynamo Kiev - faded in the second half. 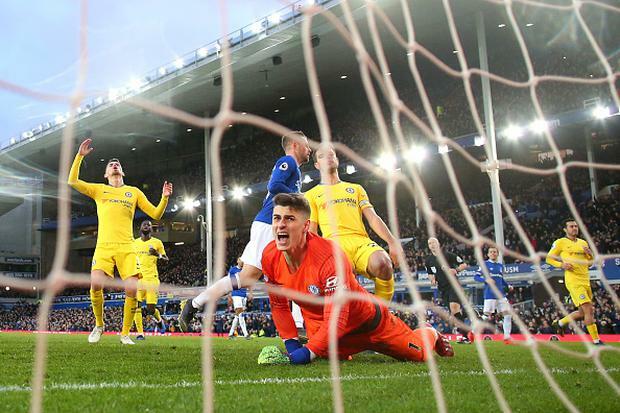 Calvert-Lewin's downward header at a corner was parried by Kepa Arrizabalaga but Richarlison reacted quickest to nod home the rebound - Everton's first league goal against Chelsea since January 2016. Pickford, criticised for his role in the defeat at Newcastle last week, threw himself to his left to brilliantly save Higuain's deflected half-volley. Chelsea boss Maurizio Sarri made a double change with Ruben Loftus-Cheek and Olivier Giroud replacing Barkley, much to Goodison's delight, and Higuain. However, it did little to change the momentum with Hazard now a peripheral figure and - 18 minutes from time - the hosts delivered the killer blow when Marcos Alonso brought down Richarlison and Sigurdsson scored with a rebounded penalty after Kepa saved his initial effort. With the teams above them in better form, winning the Europa League - with Chelsea in the quarter-finals and on the easier side of the draw - may now be their best chance of securing Champions League football this season.